The Historic Centre of Riga boasts the largest collection of Art Nouveau buildings in Europe. Between 1896 and 1913, the city expanded and a housing boom followed. 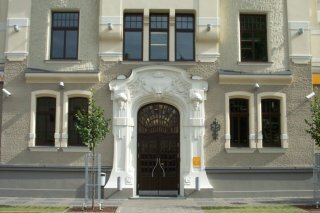 The style which developed in Riga was influenced mainly by German, Austrian and Finnish architects. Mikhail Eisenstein is one of the most famous proponents of the style in Riga. After the revolution of 1905 a distinctively Latvian variation of Art Nouveau developed, known as National Romanticism. Architects started to use traditional Latvian folk elements and natural building materials. Typical elements were steep roofs, heavy structures and the use of ethnographic ornamental motifs. Riga as a city made its first mark in history in the 1201. In that year, Albert the Bishop of Bremen established his first German fortress here. With his Knights of the Sword he executed a Crusade to the Baltics. The town started to prosper as a trading station. This resulted in joining the Hanseatic League in 1282. Walking around in Riga (you really have to pack good shoes here), what most surprises is the ecclectic architecture. Notably in the Old Town there is always a medieval highlight next to some Stalinist leftover. This diversity in styles adds a lively atmosphere to the town. Generally, Riga is less open-air-museum like than Talinn for example. 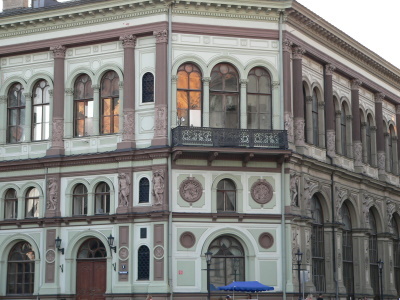 The main reason for inclusion is Riga's fine collection of Art Nouveau buildings. They can be found a few blocks north from the city center. There are several streets adorned with great specimens. The buildings by Mikhail Eisenstein are well restored and freshly painted. Another feature of Riga are the 19th century wooden buildings. They are less prominent than the Art Nouveau ones, and less often renovated. Riga was the last of 3 Baltic capitals that I visited, and I have a hard time making up my mind on which is the nicest. Vilnius is a Central European, Catholic city with Baroque architecture, similar to Krakow, while Tallinn is a Northern European, Protestant city with brick buildings. Riga is somewhere in between, reflecting its geographic position, but a bit closer in most aspects to Tallinn than to Vilnius. Like the others, it is an immaculately clean city with a fine historic centre full of interesting buildings, most of which are clustered in the medieval core (particularly the Dome Cathedral and St. Peter's Church with its lookout tower). The cherry on Riga's cake is the large Art Nouveau/Jugendstil district to the north of the centre, where you can walk around for a long time admiring the stunning facades. A good place to start is the Art Nouveau Museum, which is housed in an original buiilding and features a unique staircase. I only had a weekend in Riga, but I'm sure that you can easily fill several days exploring this interesting city,. I visited this WHS in September 2016. Having visited all 3 Baltic state capitals I was pleasantly surprised with Riga and its magnificent Art Nouveau buildings and one of the top WHS I visited in Europe. The historic centre is pleasant enough to warrant a visit but in my opinion the absolute highlight and source of the OUV of this WHS are the Art Nouveau buildings especially those concentrated in Elizabetes iela, Alberta iela and Strelnieku iela. Apart from the Art Nouveau Museum of Riga which is open every day from 10:00 till 18:00 (except Mondays), my favourite facade was that of 10B Elizabetes iela (picture) with its bright blue colour and richly decorated female mascarons, stylised birds and geometric ornaments. Best time for photography is once again early morning just after sunrise and late afternoon. I'd recommend investing in a good guide book with pictures and the specific addresses so you can easily identify the ones you visit and then be able to read more on them afterwards. The UNESCO plaque/manhole displaying Riga's inscription can be found just in front of the Evangelical Lutheran cathedral of Riga in Cathedral Square next to an excellent bar and souvenir shop named Key to Riga. Do try the local Black Balsam liquor and/or sweets as they are a delicacy. The restored House of the Blackheads seems really out of place as you'd expect that type of building in the Netherlands or Flanders but its quite an iconic building. The wooden houses are quite a long distance away from the historic centre but well worth the effort to see yet another district of Riga which is not so touristy. The Riga by Canal 1 hour boat trip is pleasant but overpriced (18 euros). Another district worth visiting is the Spikeri quarter with its 20th century warehouses now used by creative industries and the Soviet/Stalin architecture of the Latvian Academy of Sciences. All in all I spent 3 nights in Riga and I would have enjoyed a longer stay. Riga has sat front and centre of my future trip plans for a long time, it was even supposed to be the destination of our honeymoon until circumstances pushed us elsewhere. Additionally my trips to the other Baltic capitals had been wonderful for various reasons, so how did Riga stack up against these high expectations? Well, we really enjoyed our weekend in the Latvian capital, it was a case of meeting rather than exceeding expectations. As other reviewers have said the old town was rather pleasant though not as impressive or immaculate as that of Tallinn but certainly a lovely place to be. In addition to the normal winding cobbled streets of European old towns there is the impressive collection of art nouveau edifices, including the highly recommended Hotel Neiburgs. However the main Art Nouveau treats are in the new town and we had a great morning exploring the remarkable array of buildings, especially those along Alberta iela, culminating in the small and pleasant Art Nouveau museum and the gift shop on the opposite side of the road. We had a lovely stroll around the new town, stopping to peak into the Orthodox churches then for some coffee and cake, before heading to the massive central market on the other side of town. The evenings allowed us to do a bit of restaurant and bar hopping, with Folkklubs ALA pagrabs being a real highlight. It was a great place to sample local food (grey peas) and drink (a huge array of unpasteurised beers and Riga Black Balsaam). It was all very enjoyable and as with the other Baltic capitals really friendly and welcoming. Well worth a slow weekend, and if you have an interest in Art Nouveau this should certainly top your list of must visit destinations. 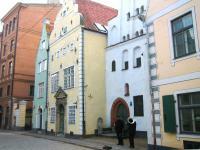 The old town of Riga is not very big, but full of beautiful homes and churches in Hanseatic style. It is full of nice restaurants and cafes, where you can spend the time just admiring the architecture. Most of the old buildings are very well preserved and the whole area is safe and clean. The thing that I liked the best in the old town is the St. Jacob's Church and the surrounding quiet lanes. Especially in winter an ideal place for walking. 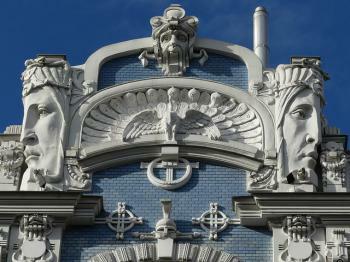 I love Riga, specialy the World Heritage Site, yours nice buildings Art Nouveau. Each detail is so special. I saw a video in the Riga Art Nouveau Museum about the buildings and their architects. I'd like to buy on DVD like that. I wish every old building will be restored. Konventa Seta where I stayed during my visit is located very conveniently to most of the fascinating destinations in the city. The old cobble stone streets are negotiated by the most modern young women in heels(!) headed for their places of work. Every visitor should take back with them some form of amber for which the Baltics are known. 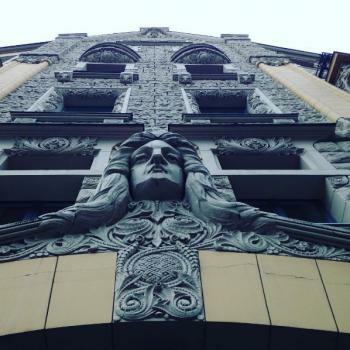 And, of course, the magnificent art nouveau buildings could take the whole day to inspect and admire. Riga citizens seem to have a way with flowers, too. Visitors should check out the unusual floral arrangements at most flower markets and the imaginative plantings in the parks. Last, but not least, Laima chocolates! Recently I spent 5 sunny days in Riga. Enjoyed a ballet and an opera performance in the National Opera. Impressed by the architectural gems I made long walks in the central parts of the city and in the "Old Town". A significant drawback is the fact that almost all museums are closed Monday and Thursday that is the same days. Another problem is the way cars are driven leaving pedestrians to trust their good luck. Street crossing in corners without traffic lights equals suicide. Even at street lights some drivers arriving late to a corner do not respect red lights. Riga, the heart of Latvia goes back to the early 13th century and today it is the largest town in the country and also in the Baltic's. In difference to Tallinn in Estonia and Vilnius in Lithuania there is a quite different pulse in Riga. There is a lot to see and do in this town and as a World Heritage Site it first of all offers you a seductive Old Town with narrow alleys and a medieval atmosphere. I have visited Riga twice over the last 10 years and can conclude a gradual change from a quite confused, run-down post-Soviet state to a town slowly becoming more and more westernised, with new shopping centres popping up both in and outside the city. My hope is that it still keeps it charm in a similar way Tallinn and Vilnius have managed to do. The Old Town, besides being littered with numerous strip-clubs (which was not there at my first visit in 1997), offers you brilliant 14th century Hansa-styled cathedral, an old Livonian castle dating back to the early 12th century and today the home of the Latvian president. Not to be missed is the famous House of the Blackheads near St.Peters Church and the river Daugava. In my personal opinion, the Old Town is at its absolute best at the former Konventa Seta, an old monastery that's been turned into a hotel. An absolute must for anyone visiting Riga is to walk up to the Albert and Elisabetes Street and check out the famous Art Noveaux buildings, works of famous architects like Eizenstein, Scheffel and Peksens and some of the most beautiful in its class in Europe. Another must-do in Riga is the food market, housed in old Zeppelin hangars, just behind the train station. I'm from Riga. I have travelled a bit in the other European countries, and I can say that Riga has so wonderful architecture, old town, art nouveau sights.. I just love to look up in the sky when I walk through the streets and watch details of houses, and everyday I see something new, every day a new experience! Some sources claim that Riga was the only European capital to survive WWII destruction. While I can not confirm this, I can still say a word on behalf of this strange city. Obscure little cafés, the ludicrous mixture of medieval beauty and Soviet monuments, chocolate bonbon stores, poverty, luxury.. What ever you find to be of contrast in the world, can be found in Riga, at least in some form. I am living here for 12 years now. The city is magnificent, and it is ridiculous that most tourists see just the Old City which looks rather similar to hundreds of Old Cities elsewhere in Europe. Ok it is not bad at all but you should see the boulewards, the thousands of Art Noveau and Eclectism style houses, thousands of ornate wooden houses (most unfortunately are in bad condition). Hundreds of times I have found inspiration and joy just by looking at incredible beauty of these houses. Come and see Riga before it is spoiled by mass tourism and modern, tasteless architecture! Modern Urban Planning: The property is an outstanding example of the building reform movement that contributed to improving housing and living conditions for people with low incomes through novel approaches to town planning, architecture and garden design. Communism: Sculpture of the Latvian Red Riflemen, some of whom became Lenin's personal bodyguards. "Some view the monument as a symbol of the old communist system and would love to tear it down. Others believe it is a necessary tribute to Latvians who fought in the early years of WWI." Peter the Great : (Then owned by Sweden)- "His first stop was at the Baltic town of Riga, where Peter took a vivid interest in the town's fortifications, based on the ones of the Famous French Marshal Vauban. Things got too far however, when a local guard ordered Peter away when he found that the young Russian was taking measurements of the Fort's walls and making sketches. Peter would never forget this incident and it would come back later when he declared war on Sweden, citing his rude reception at Riga as an excuse". Peter was present at the capture of Riga Riga is currently proposing to "give back" its statue of Peter the Great to St Petersburg as a 300th birthday present -"Some want to offer the statue as a present of goodwill. Others see it as a Russian occupier and want it out." Named after Adolf Hitler: Brivibas iela was was renamed "Adolf Hitler strasse" during the Nazi occupation (and then "Lenin iela"!!") It IS included within the inscribed area which consists of Old City, Boulevards and Suburbs. Brivibas Iela goes out from the edge of the old city and is shown in both these areas (marked 2 + 3) on the UNESCO map. Also quote from AB review "National Romanticism evolved from Jugendstil in Latvia, again on the Finnish model. This movement is represented by the work of architects such as E. Laube, K. PekSens, and A. Vanags, with some striking examples of their work in Alberta and Brivibas Streets." Built or owned by Dutch: Von Dannenstern House at 21 Marstalu iela in the Old Town, which was built by the Dutch merchant of the same name who owned a wine shop in Riga. Dubbed as another WHS: Riga between the wars was called 'The Little Paris of the North', when it was where Western spies and diplomats went to have fun.